The small towns of Lawai & Kalaheo are located on Kauai’s south side. The towns are located in the hills “mauka” of the coastline. There is not much commercial activity in Lawai. However there is a convenience store there that is know for the best “Manju” (a Japanese confection) ever. Kalaheo although bigger then Lawai is still a small town. It does have it’s own elementary school, Kalaheo Elementary School. There are a few mom & pop type stores, businesses and restaurants in Kalaheo town. 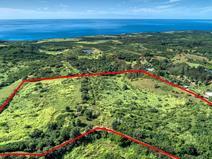 Because of the higher elevation of Kalaheo, many homes and properties in Kalaheo have sweeping ocean views and larger size lots. The weather is often a few degrees cooler then the south & west Kauai towns closer to the beaches. The Kukuiolono Golf course is a public golf course located on Puu Road in Kalaheo. It’s been described as an inexpensive “quick 9” with expansive ocean views. There is not much industry in Lawai & Kalaheo. Most residents in Lawai and Kalaheo commute to either the west side, Poipu or Lihue to work. There is one residential condominium complex in Kalaheo and a selection of residences from starter homes to large estates.